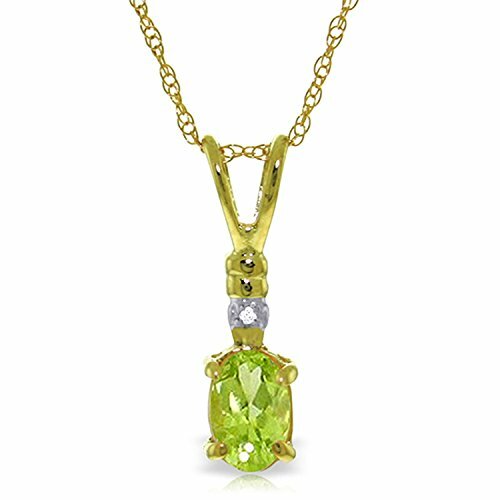 ALARRI 0.46 Carat 14K Solid Gold Love Murmur Peridot Diamond Necklace with 22 Inch Chain Length by ALARRI at Fdccla. MPN: 3033-22. Hurry! Limited time offer. Offer valid only while supplies last. This 14k solid gold necklace with natural diamond and peridot is the perfect way to show off this bright shimmering color that peridot is loved for. This 14k solid gold necklace with natural diamond and peridot is the perfect way to show off this bright shimmering color that peridot is loved for. One oval cut peridot is set in 14k yellow, white, or rose gold and dangles from a matching 18 inch rope chain that makes it very wearable. The beautiful .45 carat stone is highlighted with the addition of one'small round cut genuine diamond, which adds a touch of shine and extra luxury to this beautiful piece. This amazing pendant looks fantastic when paired with multiple other gemstone pieces, while also making a wonderful birthstone piece for women born in August.